Engineers have figured out how to make rounded crystals with no facets, a design that mimics the hard-to-duplicate texture of starfish shells. The discovery could one day lead to 3D-printed medications that absorb better into the body. Both the crystals’ shape and the way they’re made—using organic vapor jet printing—have other promising applications, researchers say. The geometry could potentially be useful to guide light in advanced LEDs, solar cells, and nonreflective surfaces. “We call them nanolobes. 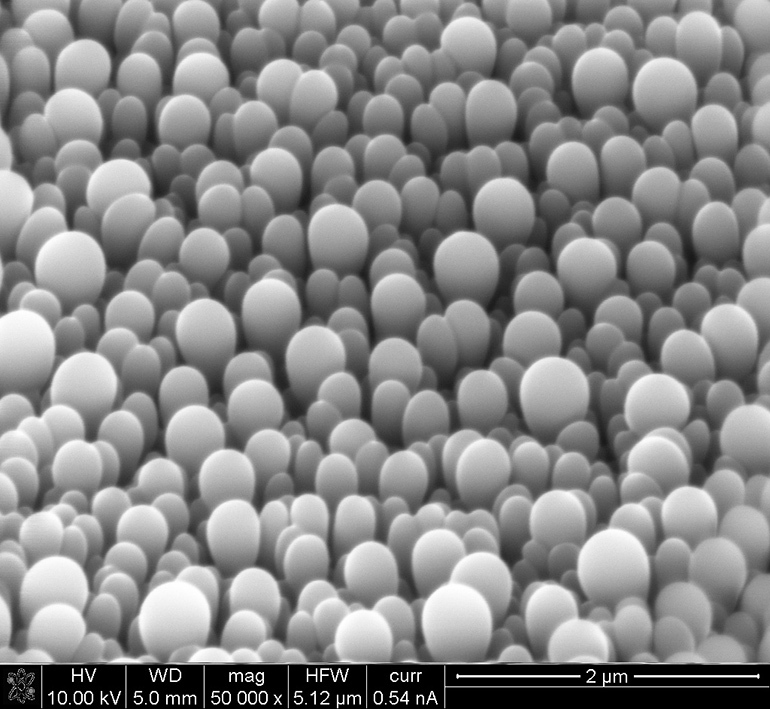 They look like little hot air balloons that are rising from the surface,” says Olga Shalev, a doctoral student in materials science and engineering at University of Michigan. The nanoscale shapes are made out of boron subphthalocyanine chloride, a material often used in organic solar cells. It’s in a family of small molecular compounds that tend to make either flat films or faceted crystals with sharp edges, says Max Shtein, associate professor of materials science and engineering, macromolecular science, and engineering, chemical engineering, and art and design. Researchers made the curved crystals by accident several years ago. They’ve since traced their steps and figured out how to do it on purpose. In 2010, Shaurjo Biswas, then a doctoral student, was making solar cells with the organic vapor jet printer. He was recalibrating the machine after switching between materials. Part of the recalibration process involves taking a close look at the fresh layers of material, of films, printed on a plate. Biswas X-rayed several films of different thicknesses to observe the crystal structure and noticed that the boron subphthalocyanine chloride, which typically does not form ordered shapes, started to do so once the film got thicker than 600 nanometers. He made some thicker films to see what would happen. At 800 nanometers thick, the repeating nanolobe pattern emerged every time. “At first, we wondered if our apparatus was functioning properly,” Shtein says. For a long while, the blobs were lab curiosities. Researchers were focused on other things. Then doctoral student Shalev got involved. She was fascinated by the structures and wanted to understand the reason for the phenomenon. She repeated the experiments in a modified apparatus that gave more control over the conditions to vary them systematically. Shalev collaborated with physics professor Roy Clarke to gain a better understanding of the crystallization, and mechanical engineering professor Wei Lu to simulate the evolution of the surface. She’s first author of the new paper that is published in the current edition of Nature Communications. “As far as we know, no other technology can do this,” she says. The organic vapor jet printing process the researchers use is a technique Shtein helped to develop when he was in graduate school. He describes it as spray painting, but with a gas rather than with a liquid. It’s cheaper and easier to do for certain applications than competing approaches that involve stencils or can only be done in a vacuum. The researchers are especially hopeful about the prospects for this technique to advance emerging 3D-printed pharmaceutical concepts. For example, the method offers a precise way to control the size and shape of medicine particles, for easier absorption into the body. It could also allow drugs to be attached directly to other materials and it doesn’t require solvents that might introduce impurities. The US Department of Energy, the National Science Foundation, and the Air Force Office of Scientific Research provided funding for the study.